but omg.. this is unreal.. could double my money again on LTC! 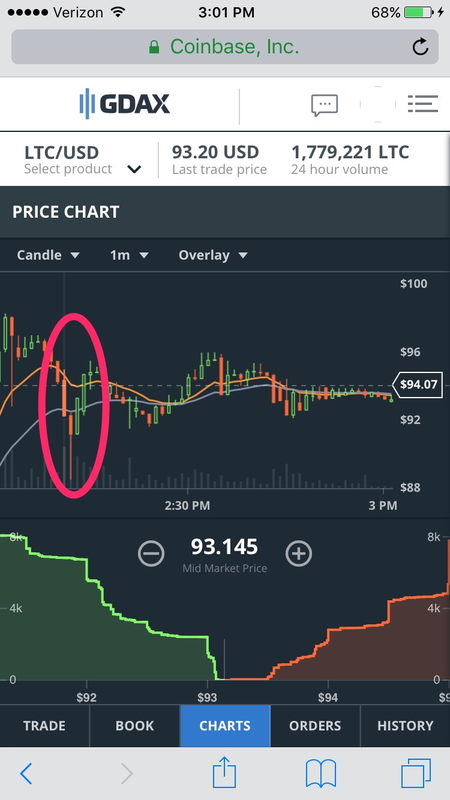 What happens when those sell orders execute? Beats that crap back down to $85? Depends how the orders are set to execute. Need to execute market orders to full those open limit orders. It just inhibits upward movement when there are that many. Same thing keeps the price from dipping below a certain price point with open buy orders. Between 2-2:15 it got up to $98.28 and hit some market sell orders and fell to $88.5 in about a minute. There were enough buy orders that it jumped back to $93 almost instantly. We will make it to $100 but those are just slowing down the inevitable. Smart money sold at above $95 with the meteoric rise, and immediately set limit buy orders at ~$86-88. I really thought about it but, I didn't want to impede the pump. It's in a down swing again after some profit taking. I have done it once, but the panic sell is not the way to go. Either set a stop loss or don't even get in. Long term growth. Just way higher than I would have thought by Sept 1. BTW guys, hopefully it's been obvious, but if not, use GDAX if you're actively trading. If you are just wanting simplicity then use the Coinbase website or app. There are fees for buys and sells with just the Coinbase app, which covers the convenience. Transfers(crypto, and already confirmed USD account balances) are instant and free between Coinbase and GDAX and vice versa. So, if you are wanting to actively trade or avoid fees, GDAX. Even though he won't show his face here anymore I just wanted to let him know. Hey, ERII, clean the streets that I used to walk. I have mentioned this in the dead blockchain thread, but this NK nuke thing is pumping the crypto markets right now. If you have been redirected here from the movie thread this is the rest of the post. If not, then this was a reaction to the documentary 'Banking on Bitcoin' which is on Netflix right now that I just finished. This could also be a cross post with the pit thread self-consciousness. There are few things that you cross in life that immediately grab and hold your attention. Some have that more than others, and the subjects are different for everyone. Blockchain technology and Bitcoin(all cryptos) are one of those topics for me. I had heard about Bitcoin in the past, but the mindset and my priorities were in a different place. I have stated this on several occasions but Blockchain technology will change the world. I watched some Bitcoin core announcement stuff also tonight, but I just finished the doc 'Banking on Bitcoin'. Probably the most interesting and inspiring doc I have ever watched. Some would say(maybe rightfully so) that I have pretty much become obsessed with crypto currencies. I mean I started a thread about it and jokingly used crypto terms describing I hard forked a thread. Crazy right? Actually probably not, I just see the potential more than others. What I already knew before the two crypto things I watched tonight were, that Bitcoin and others are becoming more and more mainstream, and that MANY others have caught the same interest and desire to learn more about cryptos. This interest or obsession is not isolated, it's spreading, just like the networks that support these currencies. This doc had many interviews and was going through timelines of when things happened. The time frame when most of this very early development and expansion was going on was during a very unstable part of my life. If I had the money or resources back then that I do now, and actually knew about it, I would be a very well off person. However that is not the case and I can't beat myself up over that fact. Maybe it was for the best, and maybe not, certainly it was a great time for a lot of the early investors and Silk Road people. Good thing I wasn't into drugs or this could have ended me. I have talked almost exclusively in these threads about monetary gain, which does have its place, sure. I wouldn't have interested as many people to invest in LTC as I have, and those people wouldn't have made any money either. The real value(outside of straight cash homie) is that of freedom to send and receive yours and other peoples money without a 3rd party controlling it. We are a long way from mass adoption, but think about the entire world using something like BTC or LTC. You can travel across any border in the world and have an accepted currency. There is no central bank issuing or denying that your currency has any value or is acceptable. The argument can be made that you have to have internet connection to accept something like BTC or LTC. That is a valid point, however, all of the worlds used phones are going to third world countries, which are getting internet access. Application layers like Lightning Network(LN) allow for off chain transactions, which apply SPV(Simple Payment Verifications) which don't require having a node with the full blockchain to confirm the transaction. This enables scale ability and expansion that is currently not possible. I may talk more about BTC and LTC to my IRL friends than I probably should. I also probably bring up the fact I told them to invest in them when they were still cheap when they didn't. I also may have some friends that when I bring this up say that I was too vague and question how they can even buy something like this. However I know what I know, and that is that this isn't just some fad. This isn't just some geeks creating fake wealth. This isn't just a speculative market and dream that will never go mainstream. This is something real, this is something that will change the world, this is something that will become mainstream. When it does go mainstream nobody will care what the code looks like or what the backend does, just like nobody cares how HTTPS and TCP/IP works. For the ones that do know tho, and the ones who build it, this is a game changer. I watched a bitcoin doc and had a reaction. I have been really lazy about it but I finally moved everything I own off the exchanges yesterday to hardware wallets. 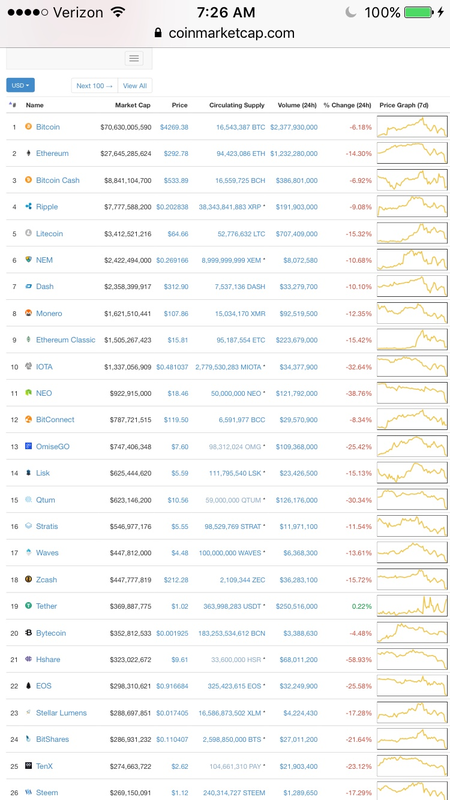 Right now is a time to hodl and not even watch the market until it settles again. I've never bought any ICO so it should stabilize once everyone is done panic selling. If you time it right this is an amazing buying opportunity tho.